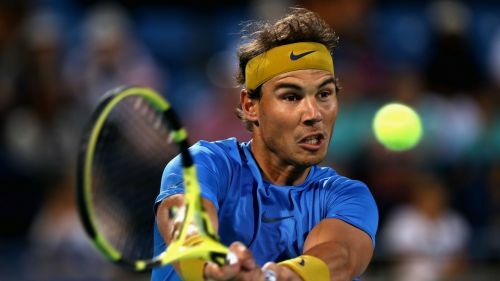 The King of Clay, Rafael Nadal Parera is a professional tennis player who is currently at the world no. 2 spot in men's singles tennis by Association of Tennis Professionals (ATP). The Spaniard has clinched 17 Grand Slam singles title in his career so far which is the 2nd best statistic in the history of tennis for a male player. He also has a record 33 ATP World Tour Masters 1000 Titles, 20 ATP World Tour 500 Tournaments and an unforgettable 2008 Olympic Gold in Singles category and 2016 Olympics Gold in Doubles category. Introduction to the Game- His uncle, Toni Nadal introduced the champion to tennis when he was only 3 years old and also pushed him to be left handed because he played forehand shots with both hands. Success Started Pouring in- He entered the professional world of tennis at the age of 15 and at 17, he made it to the list of 100 Best Tennis Players in the ATP ranking. Also at the age of 17, he became the youngest player to reach the third round of Wimbledon. Fame in the name of Uncle- Earlier in his career, Nadal was famous for being the nephew of Soccer player, Miguel Angel Nadal but all hail his super amazing talent! He earned worldwide recognition on his own and still amazes us every time he is on the court. Asteroid story- There is an Asteroid which has been named after Rafael Nadal and it was discovered in 2003. The asteroid was previously known as 128036, is of 4 Km in diameters and travels through space at a pace of 20 Km per second. Now that's really amazing!! Best Match in Tennis History- At the 2008 Wimbledon, the longest final was played in the history of the tournament between Nadal and Federer, which is said to be the best tennis match played ever till date. After 4 hours and 48 minutes of non stop action, the Spaniard lifted the trophy and walked away with all the glory. Personal Interests- It is known that in free time, the champion likes to get on with Playstation and his favorite football club is Real Madrid. He is also a fan of Real Mallorca. Adding to his fame and glamour, he has also been featured in Shakira video. Rituals before Game- It is said that Nadal always takes a cold shower before a match and his habit of biting his trophies is well-known. He's also afraid of dogs and darkness. School After him- Nadal started a school at Anantapur, Andhra Pradesh,India. It is known as Nadal Educational and Tennis School (NETS). It was started in the year 2010 and aimed at holistic development of underprivileged boys and girls. The facility was started with 90 children but currently there are total 226 participants at NETS.